Using transcranial direct current stimulation can improve object naming following a stroke, according to the results of a new study. Transcranial direct current stimulation is a type of medical procedure that can stimulate brain activity with low, direct current. More than 795,000 people suffer strokes each year, according to the Centers for Disease Control and Prevention (CDC). Stroke is a leading cause of morbidity and disability. About one-third of all strokes results in aphasia, according to the National Aphasia Association, which impairs patients’ ability to speak and process language. Many stroke survivors with aphasia have difficulty naming objects correctly. The results of the study show that patients who underwent anodal transcranial direct current stimulation (A-tDCS) showed greater object-naming after treatment when compared with those stroke survivor participants who underwent a sham procedure that did not deliver current. While behavioral treatment for aphasia provides some benefit in improving speech, major deficits remain. A-tDCS can modulate cortical activity to either facilitate or inhibit behaviors. Transcranial direct current stimulation (tDCS), is a painless and noninvasive brain stimulation treatment that stimulates specific parts of the brain through the use of direct electrical currents. tDCS devices are small, battery-powered devices. Practitioners place electrodes on the patient’s head; headgear in the form of plastic straps holds the electrodes on. A cable connects each electrode to the stimulator. A constant, low-intensity current moves through the electrodes to modulate neuronal activity. In this study, researchers performed a sham controlled, double-blinded, randomized trial to evaluate the used of A-tDCS with a futility design. The results of the study showed that the use of A-tDCS in patients participating in speech therapy for stroke-related aphasia were better at object naming. 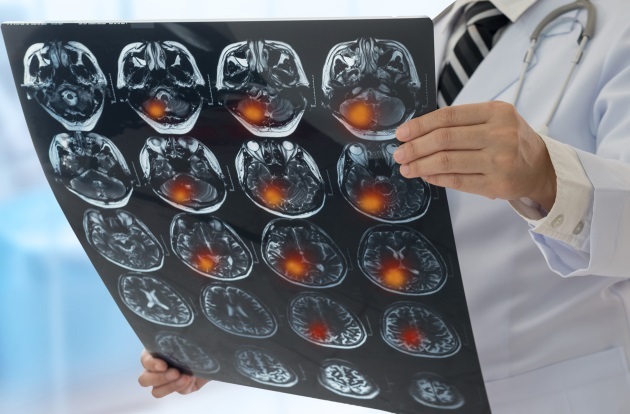 The researchers enrolled 74 participants who had experienced a with single-event ischemia stroke in the left hemisphere and who suffered the stroke at least six months prior, were between 25 and 80 years old, were right-handed, and who had no contraindications to MRI. All participants had received a diagnosis of aphasia as the result of an assessment using Western Aphasia Battery-Revised criteria and had achieved 65 percent accuracy on screening aphasia treatment testing. The participants in the test group underwent 3 weeks of standard outpatient therapy that included 15 sessions at 45 minutes each, combined with A-tDCS. Participants in the control group underwent a sham procedure combined with standard therapy. The sham procedure included the same steps as A-tDCS but did not deliver electrical stimulation. Change in object naming accuracy was set as the primary outcome. The researchers assessed the participants’ ability to name objects twice before and after therapy. The increase from baseline naming was greater for the A-tDCS group than for those in sham procedure group at 13.9 (2.4) words, (95 percent CI, 9.0-18.7) for the A-tDCS group versus 8.2 (2.2) words (95 percent CI, 3.8-12.6) who underwent the sham procedure. This means there was a 70 percent relative increase for those who underwent A-tDCS compared to those in the sham group. The study has a rigorous, blinded and sham-controlled design, but its small sample size could not definitively confirm that A-tDCS was superior. Furthermore, the study is limited in that the endpoint reflects performance on testing scores but does not provide data on patient quality of life or functional status in the real world. The results of the study suggest that further research into the use of A-tDCS for aphasia recovery after a stroke may be warranted.